Preparing an acorn squash is as easy as 1-2-3... 1. Cut the acorn squash open. 2. Remove the fibers and seeds. 3. Season and cook. 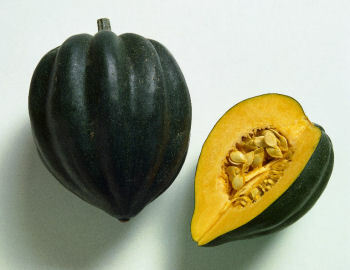 The most popular way to serve acorn squash is to cut in half, scoop out the seeds and then fill (did I just say FILL??... I mean spread) the center with butter and brown sugar. The halves are then placed on a baking sheet and roasted for about an hour or until soft. Cinnamon and nutmeg can be added to enhance the flavor. A healthier way to serve acorn squash is to drizzle it with olive oil and chopped fresh rosemary before roasting. Acorn squash is also a wonderful candidate for pureeing to create an autumn soup. You can simmer onions, carrots, and celery together in some chicken broth, and then add some mashed cooked acorn squash and puree everything; add milk to make it into a creamy soup (the chicken broth will add flavor). I like a little thyme and some sea salt and pepper to taste--talk about easy!